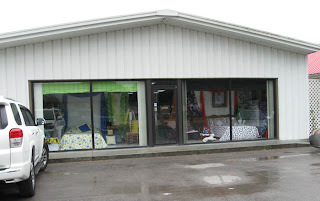 I visited two more fabric shops among the hills and fields of middle Tennessee... this time, my Blank Quilting fabric rep appointments took me to McMinnville, TN. 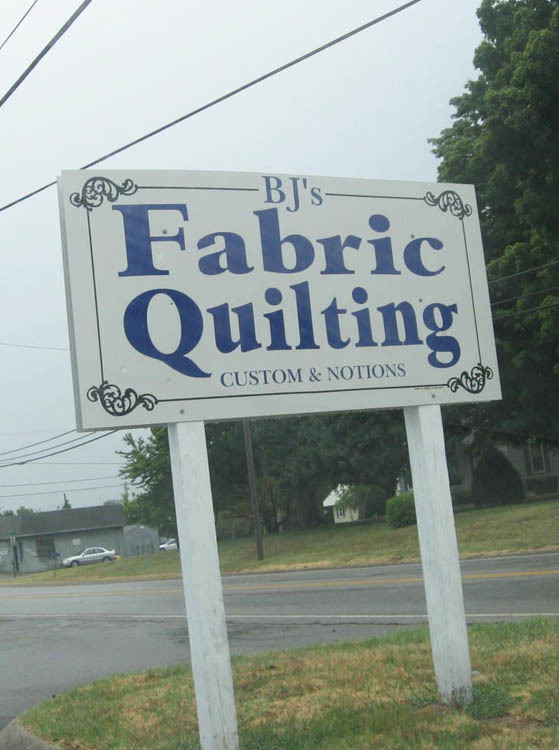 BJs Custom Quilting and Fabric in McMinnville, Tennessee. ... a cavalcade of fabrics, in waist-high recessed tables, arranged by color and theme. It's more eye candy than you can absorb in one breadth. The walls have quilted items that were stitched on the store's industrial bedspread machine. 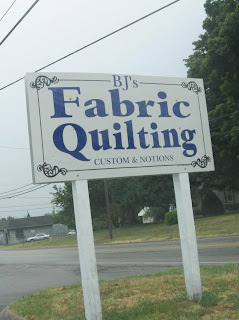 BJ (Betty), the owner, has been in the sewing and fabric industry for over 23 years. 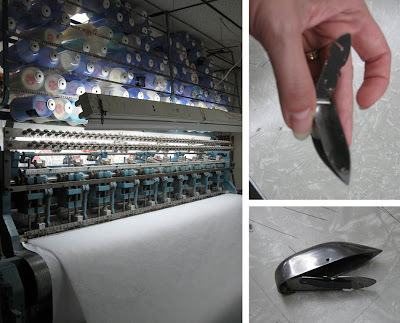 She does a lot of quilted items using a machine that has 100 needles and simultaneously stitches a bedspread-like sandwich as it inches its way through a set of rollers. BJ took me into the back room to show me this machine. "It takes 1.5 hours to re-fill and thread the 100 bobbins (shown below)," she said. Left: 100 needle stitching machine with cones of thread stored in racks above. Right: The shuttle-like bobbins for the machine. 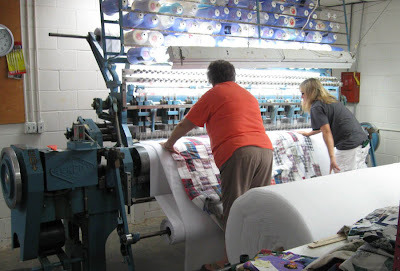 Two operators feed in the quilt top, smoothing and straightening the piece as it feeds. The chick-chick-chick hum of the machine provided a soothing background noise—not as loud as you might expect from an "industrial" machine. 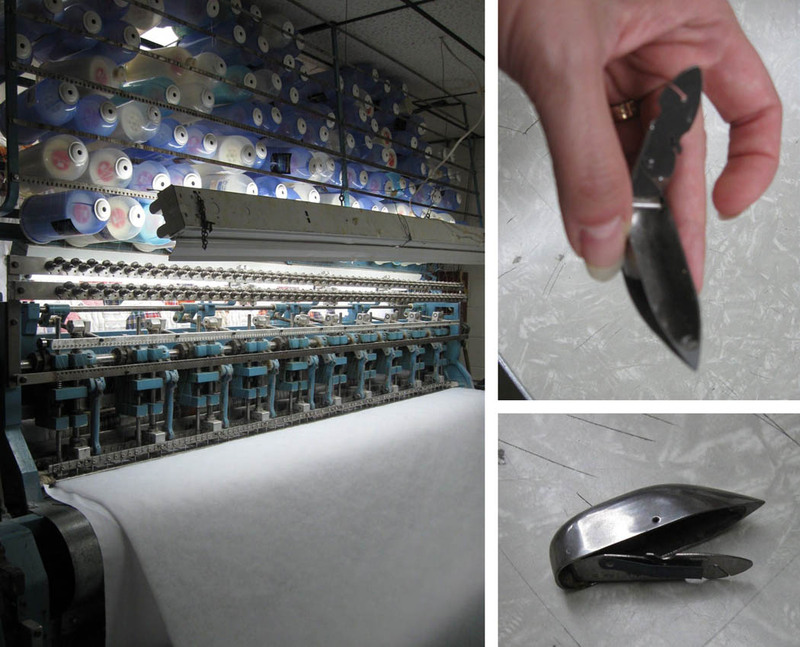 Machine operators feed a pieced top into the industrial quilting machine. 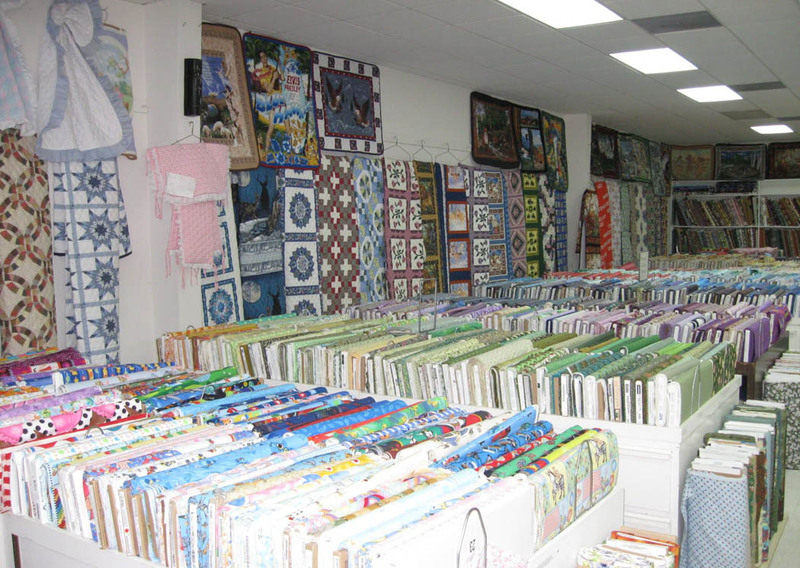 A portion of BJs Custom Quilting business is quilted baby blankets that are displayed on a hanging rack in the main room. 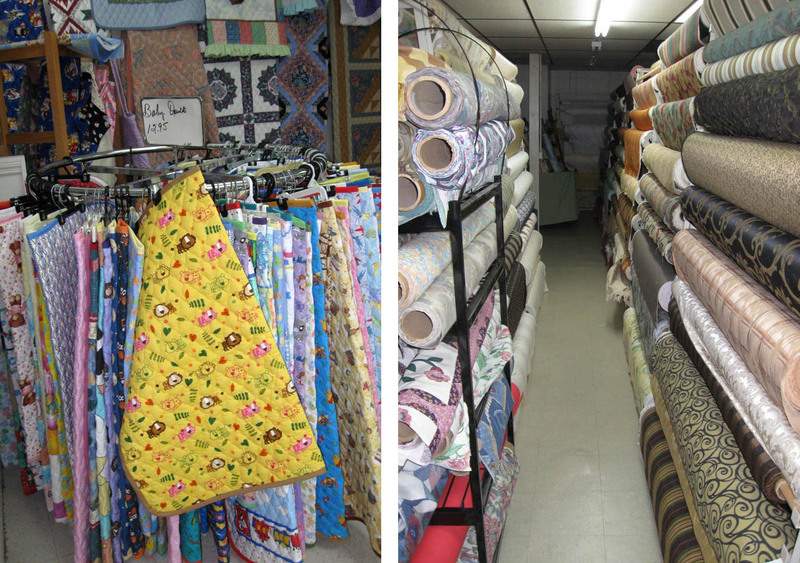 There is also an entire room adjacent to the main fabric room with rolls of home decorator fabrics. Left: A rack of quilted baby blankets. 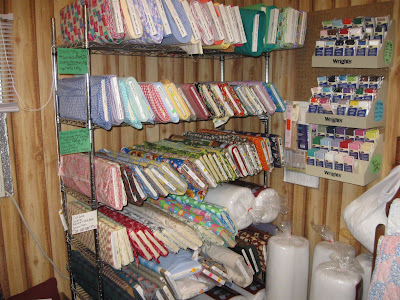 Right: home dec fabrics. Many quilter's cottons from Blank Quilting, Jinny Beyer, Erin McMorris, Tina Givens, Brandon Mably, Terri Mangat, Valorie Wells and others are mixed in with her selection of cottons. 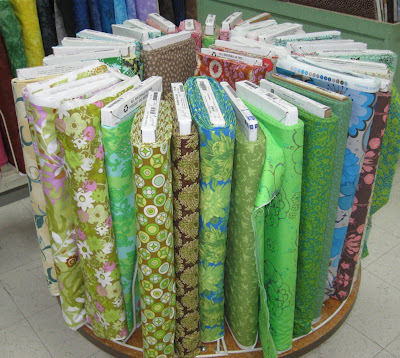 They are generally not from the most current quilting collections, but at an average price of $4.95 a yard, they are good buys. 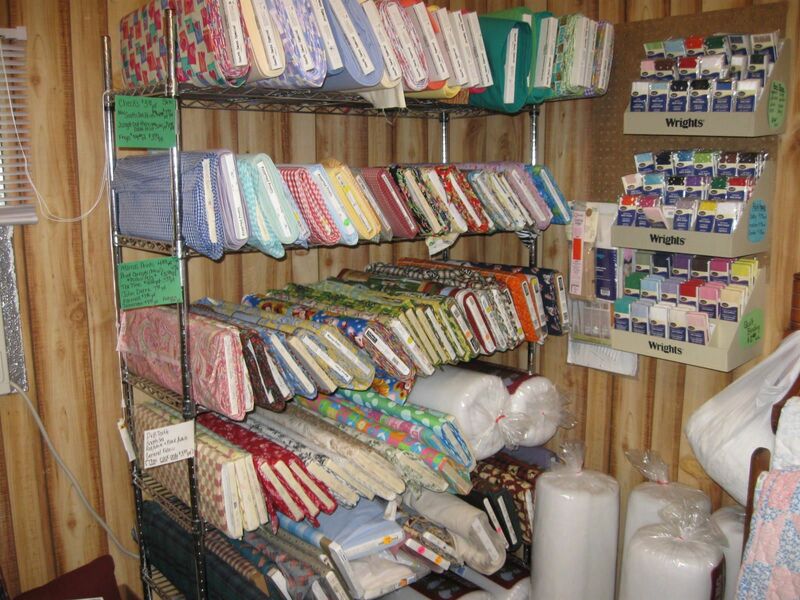 It's fun to peruse the rows and rows of bolts to find favorites you may not have in your stash. 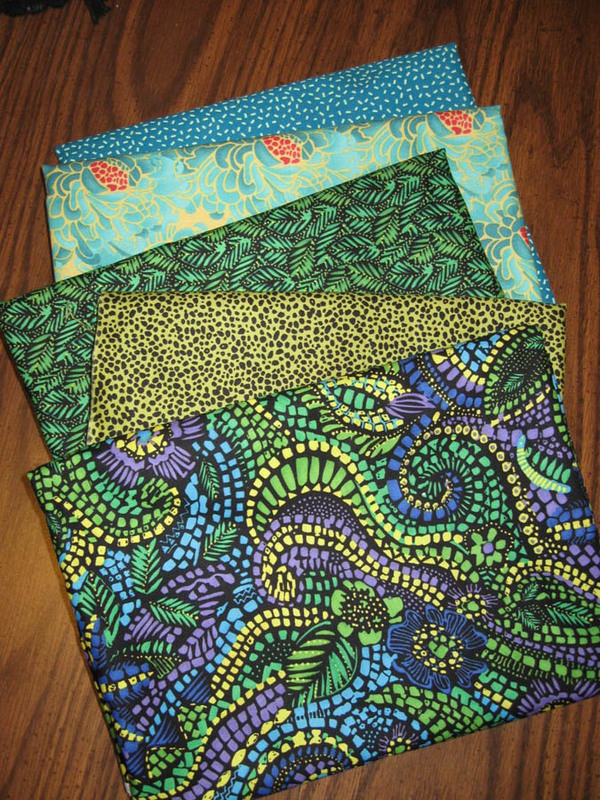 BJ tries to get the same prints and designs in several colorways whenever possible. Cotton fabrics arranged by color. Before I departed, I snatched up a few bright prints and textures to add to my own stash. A few fabrics for my stash. 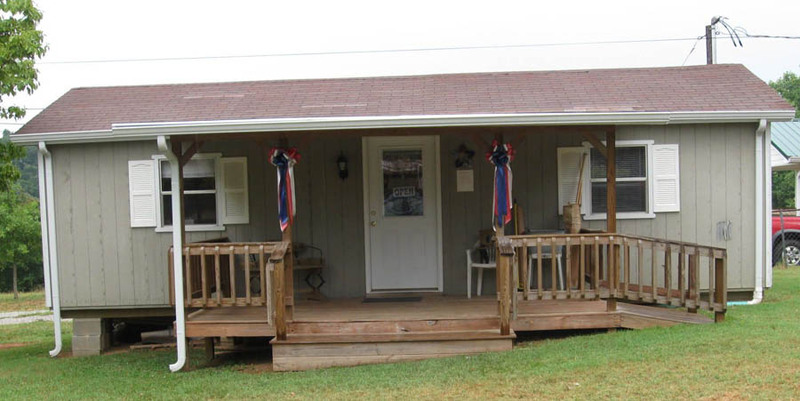 A few blocks away in a more residential section of town is the Gray Barn. Jennifer, the owner, machine quilts for local residents of McMinnville on a domestic sewing machine attached to a quilting frame. The Gray Barn Quilts and Fabric, McMinnville, Tennessee. 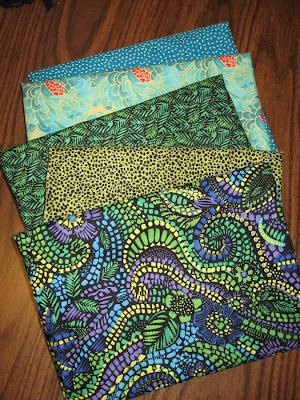 A friend of Jennifer's, Jewel, pieces tops for baby and lap quilts. The tops are quilted and sold at the shop as well. 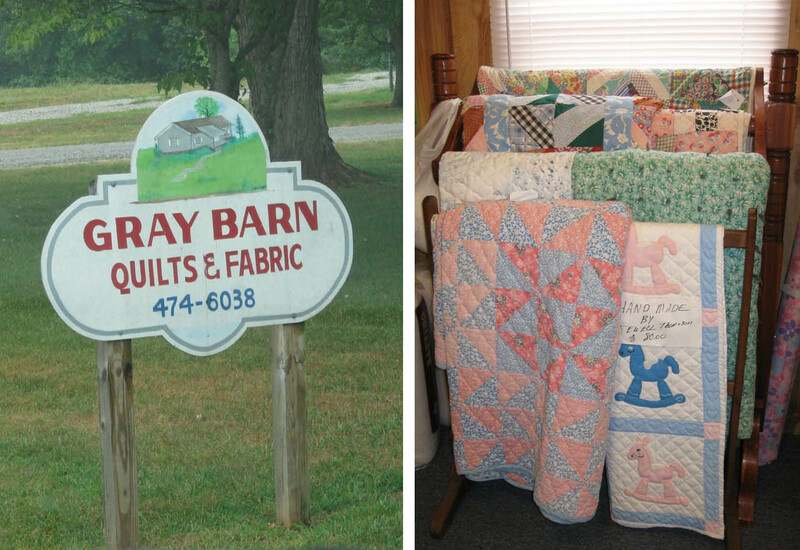 The Gray Barn sells lap and baby quilts to customers in McMinnville. The ladies from Country Lane Quilts and Gifts in Smithville, TN, told me about the Gray Barn. It is a relatively new business but the word is obviously spreading. and backs for customers' quilts.